CHARLIE COULD WE PLEASE FISH THE LOWER END of Norman NEXT TIME!!! PLEASE!!!!! I dont just know the lower end on Norman.. I planted a garden on one of the island last year so I would have food to eat while Im fishing!!.. As for the picture.... This is my impression of how Dean McClain looks when he holds up a fish whenever he sends me a photo! I would do an impression of gator but he is still castin away at Three Amigo's and lookin for a Taco! 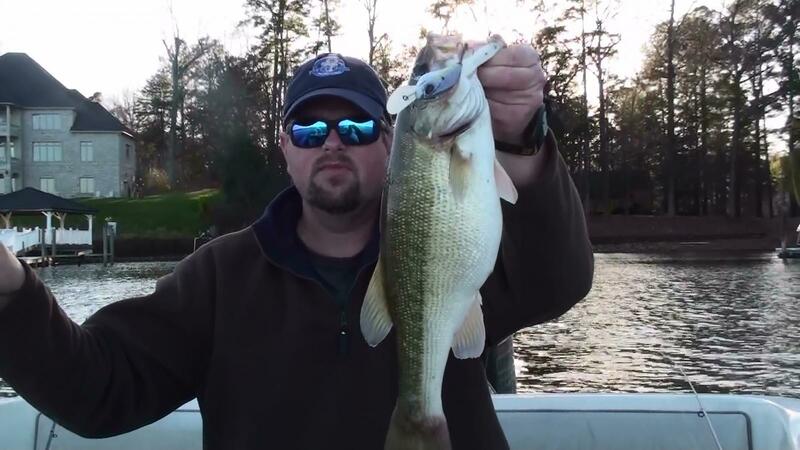 4 pound 5 oz Spotted Bass caught on Lake Norman. Very nice spot for our Lake. The state record 6.5oz was caught 2 or 3 years ago. I was kinda excited at first cause I thought I had something.. it was so fat! But then I put it on the scale and my excitement was gone...hold on a min someone is asking me a question.. I took my computer to the lake and Im fishing right now as your reading this... "WHAT's THAT SIR.. YOUR LOOKIN FOR CHARLIE..? Yeah he drives a Legend boat.. ..OH I KNOW WHERE YOU CAN FIND HIM! If your lookin for Charlie GO NORTH! LEAVE MY GARDEN ALONE." Nice Spot !! Those spotted bass fight like a smallmouth !